Making it impossible for his colleagues to enjoy a prix-fixe dinner before the theater, Majority Leader Harry Reid scheduled his vote for 8pm on Saturday on whether to begin debating the health care reform bill that he has unveiled to the Senate. It passed, by the minimum margin. Since an average of 3,750 people die daily traced back to a lack of insurance, giving up a Saturday here and there seems a tiny price to pay. I suspect Sam Cooke and Cat Stevens (both singers of this piece’s namesake) would agree. This vote contributes to Reid’s goal of getting this bill passed by Christmas. Not for nothing, but if he can fast track it by another week, maybe he can sneak in a vote while Joe Lieberman is lighting the Hanukkah candles. 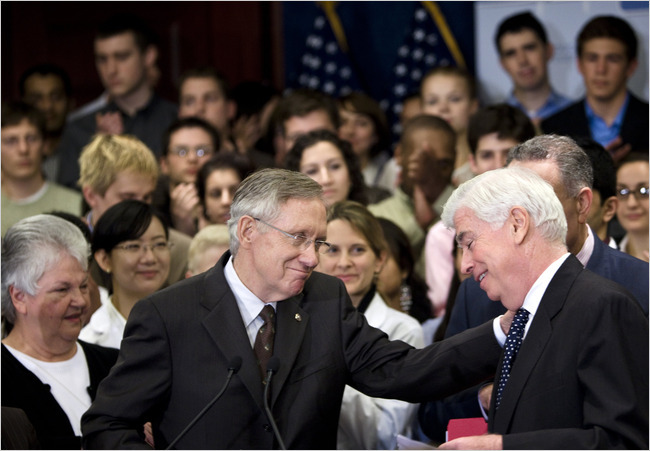 Whatever happens, the current situation can’t keep up much longer: all of these shots of Senate Democrats fawning over each other, smiling knowingly at each other are too eerily reminiscent of Frodo and Sam’s yearnings at the end of Lord of the Rings. 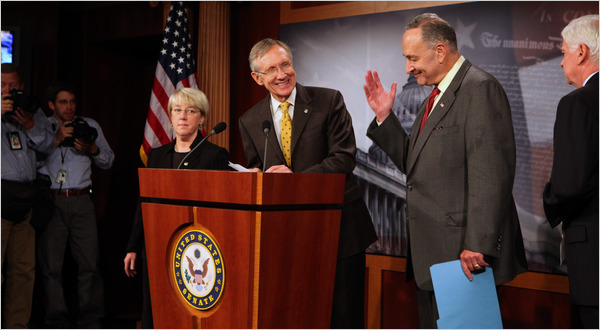 There were a few late-breaking holdouts that caused anxiety for Reid in the centrist camp. Word broke Friday that Ben Nelson (D-NE) would vote for proceeding with debate, but Mary Landrieu (D-LA) wouldn’t reveal what her vote was until the morning of the vote. In addition, Blanche Lincoln (D-AR) was an enigma until midday Saturday. They all broke in Reid’s favor for this round. This passage, of course, is just to get the ball rolling. Two more votes remain: the 60 votes needed to end debate (and avoid a filibuster) after amendments are made. That vote, called cloture, is followed by the actual vote on the bill, which needs a simple majority. After all that, the Senate and House bills are reconciled and the final product is voted on one last time. If the final bill passes, all Democrats will celebrate and Obama will get the lion’s share of the credit in public. To me though, yesterday’s vote (as pathetically difficult as it is just to get people on board to talk about a law in the Senate) is a commentary on Reid. Frankly, I have never quite understood why Harry Reid was the majority leader. Yet, Democrats like Nancy Pelosi, Chris Dodd, and Chuck Schumer speak about “Leader Reid” (a term that for some reason sounds so unabashedly lame) with such fondness that there must be something more to him. Plus he used to be a boxer, so I figured that made him tough. In campaigns, strategists and reporters often discuss the disparity (or lack thereof) between a politician’s front stage and backstage personas. Generally, it seems the more your front stage presentation seamlessly and genuinely meshes with your backstage demeanor, the better off you are. This is the subtle opposite of having a backstage demeanor that manifests itself front stage. Many analysts made the assessment that Obama settled into this first camp, while McCain was in the second. Harry Reid is with McCain here. Front stage at these press conferences, Reid is so quaint and bland he evokes Grape Nuts. Take the clip below of him introducing this momentous legislation on a signature party issue. I want to believe that a person who has risen to one of this country’s top elected positions is extraordinary. He’s so soft-spoken, it makes me doubt his claims to pugilism, or that he has ever rallied a crowd with a stump speech. He’s not a great messager: he famously said of Iraq in 2007, “This war is lost,” when he could have easily said, “Bush lost the war,” and conveyed the same thing, except placed the blame on its wager, as opposed to looking like a defeatist. Another instance of Democrats’ perpetual message handicap. Maybe Reid’s front stage persona is disarming and genuine, and backstage he is bad cop? Whatever he does off camera, in the next month he’s going to have to up his game as this saga comes to a head. Earning cloture votes from the moderates who joined him this round and the Mainers he hopes to peel off is going to require him to float like a butterfly and sting like a bee.